Shree Aniruddha Upasana Foundation (the Foundation), SAUF is a ‘not-for-profit’ charitable institution incorporated under Section 25 of the Companies Act, 1956, in April 2005, with the blessings and inspiration of Param Poojya Sadguru Shree Aniruddha Bapu (Dr. Aniruddha Dhairyadhar Joshi – MD. Medicine, Mumbai). Since the time of its inception, apart from pursuing its principal objects of setting up Upasana Centres across the length and breadth of the country and abroad and propagating the spiritual teachings and preaching of Sadguru Shree Aniruddha, the Foundation, alongwith its sister organizations, such as Shree Aniruddha Aadesh Pathak (SAAP), Aniruddha’s Academy of Disaster Management (AADM), etc. also undertake various socio-cultural activities, under the divine blessings and guidance Sadguru Shree Aniruddha. 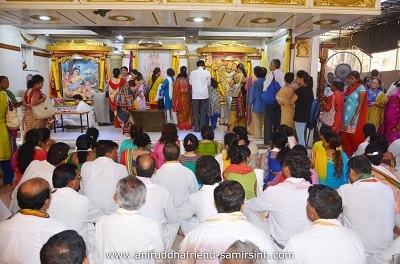 Shree Aniruddha Upasana is performed by groups of bhaktas of Sadguru Shree Aniruddha, who assemble together once a week, generally on Saturdays. 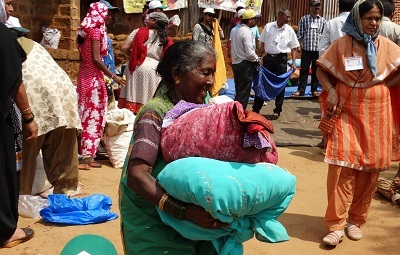 Each such group is known as a Upasana Centre. There are 634 such centres spread across the country and the globe. While it is not mandatory for performing Upasana in a group, performing Upasana in a group produces a multiplier effect of the vibrations generated by each bhakta, such that each bhakta get the benefit of the aggregate vibrations generated by the group performing the Upasana. This is a science that has been discovered and perfected in the ancient times by the rishis, who were accomplished scientists in their own right. People who are located in far flung places, that do not afford the opportunity of coming together in groups at weekly intervals, can perform the Upasana at their respective residences. The Upasana has a reverence code and a specified sequence (How to perform Upasana). The Upasana, it must be understood, is distinct from the daily prayers that we say or chant.